POJOAQUE, N.M. - As he stood outside a high school gym-turned refugee shelter, Pete Olivas was feeling numb. In 1945, his father, a Manhattan Project machinist, watched the first atomic bomb explode over the New Mexico desert near Alamogordo. This May 10, the younger Olivas and his wife, Loretta, watched a different kind of explosion, as 50 mile-per-hour winds whipped a wildfire toward their home in Los Alamos. With policemen and firemen yelling at them through loudspeakers to get out, with ashes raining onto their faces, the couple loaded up everything they could, stuffing two Harley Davidson motorcycles into a travel trailer. Now, Olivas was pulling a wagon filled with bottles of soda pop and drinking water. A few feet away, evacuees waited in line to pick up their mail from postal crews standing behind long metal tables. Inside the gym, others munched on cookies, sipped tea and stared at huge TV screens showing burning houses lit up like jack-o-lanterns. One of those houses was the one the Olivases bought in 1967. They later added a large bathroom, a big walk-in closet and a two-car garage. "I did it all myself," Olivas said of the renovation work. "I did all the plumbing and I did all of the electrical work. I don't anticipate doing that any more. They burned it. They can build it." Fingerpointing was the prevailing mode in New Mexico as the Cerro Grande fire raged through 47,000 acres of forest surrounding the Atomic City. The fire torched more than 230 houses and apartments, forcing the evacuation of 25,000 residents of Los Alamos and surrounding communities. Total costs for firefighting and cleanup are expected to run over $1 billion. Most people blamed the National Park Service, which began this blaze as a controlled burn in Bandelier National Monument, May 4. The fire escaped into the Santa Fe National Forest, where it swept into Los Alamos. The Park Service accused the U.S. Forest Service of delaying several hours before sending back-up crews after park officials first called for help. The Santa Clara Indian Pueblo accused the Forest Service of not moving soon enough to corral the fire as it burned five miles of Santa Clara Canyon on the reservation. 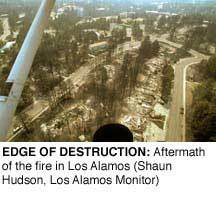 Critics also accused the Department of Energy of failing to clear enough trees around the Los Alamos National Laboratory; the fire charred 12 of the laboratory's 43 square miles and approached several facilities where nuclear wastes are stored. But across the Southwest, many fire scientists were pointing at a different culprit: a century of fire suppression and overgrazing that has turned national forests around the West into fire traps (HCN, 3/6/95: How the West's asbestos fires were turned into tinderboxes). These experts say the lesson learned at Cerro Grande is about more than the federal government's policy of lighting prescribed fires. This fire is also a warning about the dangers of unhealthy forests, and the risks they pose to growing towns in the West. 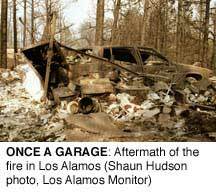 On May 18, Los Alamos residents got the admission of guilt that most had wanted. Interior Secretary Bruce Babbitt released a report outlining what he called a systematic failure of the federal government's handling of the fire. He described a series of mistakes that he likened to pebbles kicked loose from a mountainside - first one, then another, until it became a landslide. Babbitt promised that the federal government would accept liability for the burned homes. Among the errors: monument superintendent Roy Weaver had failed to thoroughly review the burn plan before approving it; the Cerro Grande burn boss lacked the proper training; the Park Service lacked adequate staff and resources at the fire scene and didn't follow its usual procedures for controlled burns. Babbitt's judgment came as a second escaped prescribed fire on the North Rim of Grand Canyon National Park was burning more than 13,000 acres. While scientists did not defend the Park Service, many echoed the words of Rob Mitchell, director of Texas Tech University's Fire Ecology Center: "A fire like this was inevitable. Los Alamos was living on the edge." Literally. Los Alamos is bounded on three sides by thick ponderosa pine forests. Many residents moved to neighborhoods along the forest boundary because they liked living in the midst of the trees. But the public had received several warnings about the fire risk. Two recent studies had predicted a fire exactly like the one that occurred - a blast that blew into the town and lab from the forests lining Pajarito Mountain. "Everyone is looking at the fact that the Park Service set this fire, and that cannot be ignored," said Tom Swetnam, director of the University of Arizona tree ring laboratory. "But there is plenty of evidence that these forests were going to burn like this sooner or later, whether it was started by lightning, careless smokers or unattended campfires. "There's no excuse for these kinds of mistakes being made," he adds. "But the great irony is that the Park Service and the Forest Service were trying to avoid these kinds of fires." Swetnam's studies have reconstructed the changing conditions in the Santa Fe National Forest that gave the Cerro Grande fire plenty to burn. The tree-ring scars chart the history of fires in the Jemez Mountains, including Cerro Grande, Spanish for "Big Mountain," Bandelier National Monument's tallest point. Swetnam and United States Geological Survey scientist Craig Allen determined that a century ago, Cerro Grande was capped by an open, grassy meadow and relatively few trees. Once or twice a decade, fires would race 1 to 3 feet high through the grasslands, but generally didn't burn hot enough to reach the treetops. The fires largely stopped in the late 1800s, after settlers introduced large numbers of sheep. The sheep ate the grass that allowed fires to spread. A decade or so later, authorities started putting out what fires did occur. Aerial photos from the 1930s and 1970s showed that thick stands of trees invaded, and eventually obliterated, most of the ancient mountain meadow, reducing grasslands by 55 percent from 1935 to 1981. Now, rather than regular low-intensity grass fires, these thick, dog-hair forests are susceptible to hotter, more destructive crown fires. The Cerro Grande fire is the fourth to hit the Santa Fe National Forest since 1977. "Once heated, the volatile gases and other materials come out of the leaves," says Swetnam. "They literally explode. It creates its own wind, and becomes a firestorm." Bill Armstrong of the Forest Service's Espanola Ranger District says he saw the firestorm coming. After the 1996 Dome fire briefly crept onto lab property, he helped organize an interagency team to try to prevent future disasters. His 1998 study predicted a 30 percent chance of a fire entering the lab over the next five years. A year later, a U.S Department of Energy study said that "a major fire moving up to the edge of Los Alamos National Laboratory is not only credible, but likely." In 1998 and 1999, congressional General Accounting Office reports warned that catastrophic fires would bombard the West. The only remedy, according to the reports, would be a dramatic federal effort costing $12 billion over the next 15 to 20 years to burn and thin the forests. Around Los Alamos, the Forest Service started work in 1998 on a proposal to thin the trees on the lab perimeter from 900 to 2,000 per acre to about 60 to 80 per acre, and to burn several thousand other acres. As the Cerro Grande fire began, the agency had just finished an environmental assessment of the $1 million to $1.5 million project and was preparing to send it out for public comment. "Our top priority was (an area) directly adjacent to the laboratory," Armstrong says. "If we could have thinned and burned, the fire would never have gotten to the homes. We did not do it fast enough. We didn't have the ability and resources to do it fast enough." Another reason the project was delayed, Armstrong said, was that he took extra time to make the environmental document "ironclad," to counteract anticipated opposition from Forest Guardians and other environmental groups that have challenged other thinning projects. But according to Forest Magazine, the Los Alamos area wasn't even the Santa Fe forest's top priority for fire-risk reduction. Rich Wands, then a Santa Fe forest fire management officer, was quoted as saying that the Jemez Ranger District, well southwest of the lab, was a higher priority because it is drier and because Albuquerqueans use it heavily for recreation. Wands now works for a Forest Service training center in Marana, Ariz., and was unavailable for comment at press time. Sam Hitt, founder of Forest Guardians, took issue with Armstrong, saying, "The fact that it takes Bill Armstrong two years to prepare an EA is his problem. The law is the law, and he has to comply with the law." Hitt contended that logging could aggravate the forests' fire risk, by opening up tree stands to drying winds and solar radiation. "There's a tremendous amount of evidence that it is not fuel densities but climate conditions that make the difference with fire," Hitt said. "No matter whether there are 60 or 7,000 trees per acre, the fires will cook" if it's hot and dry enough. That thinning project is now as dead as the blackened ponderosas. But a nationwide thinning debate is about to be rekindled. Babbitt says he will propose a program to thin trees in forests surrounding urban areas of the West. His model: a program that has operated several years under Wallace Covington, director of Northern Arizona University's Ecological Restoration Institute (HCN, 3/1/99: Flagstaff searches for its forests' future). "I hope we will really get serious about doing restoration-based fuel treatments," says Covington. "One of my nightmares is when we have a catastrophe like this, we find the public supporting draconian fuel treatments (such as) just clear-cut(ting) circles around mountain communities. But we don't have to log off all the trees so we can stop all crown fires. What we argue for is restoring forests." Covington uses tree rings, photos and other evidence to plan a thinning program to recreate a forest's appearance of a century ago. In the Mount Trumbull area on the Arizona Strip north of the Grand Canyon, his program has cut 80 percent of all trees on 1,200 to 1,500 acres. He targets trees over 16-inch diameter only if they grow where prairie vegetation existed in 1870. Still, Forest Service officials estimate that only 3 percent of northern Arizona's forests are fire-protected. In May, an interagency report found that 40,000 acres of forest around Flagstaff are at high risk of catastrophic wildfire. On May 17, Gov. Jane Hull declared a "wildfire emergency" in Arizona. In New Mexico, extreme fire danger has prompted the Forest Service to close much of the 1.1 million-acre Lincoln National Forest. Two wildfires in May burned more than 24,000 acres of the Lincoln. "We're stuck in this period of saying, 'Let's study it a little bit longer,' "says Covington, "instead of saying, 'We have a problem, we need to create some fuel breaks, but let's do it with the best knowledge.' "
In the wake of the Cerro Grande fire, New Mexico's senators, Democrat Jeff Bingaman and Republican Pete Domenici, announced that they will introduce a bill aimed at protecting Western communities from wildfire. The pair is touting the bill as a rural jobs program, not a justification for logging. But the General Accounting Office's 1999 report warned that thinning's potential was limited by widespread public concern about water, erosion, endangered species and other environmental issues. In addition, the places where thinning is most needed have a lot of commercial potential for selling the timber to logging companies, the report said. And the plan is sure to hit resistance from conservationists such as Forest Guardians' Hitt, who opposes all commercial logging, including thinning. He says cutting trees can never match burning in promoting biological diversity and can hurt the soil with roads, compaction and loss of long-term productivity. "Logging and thinning doesn't recycle nutrients. It removes nutrients from the system," he says. Covington and other fire ecologists also worry that the mistakes of Cerro Grande could seriously damage the federal prescribed-burn program. On May 12, as helicopters dropped buckets of water onto the Cerro Grande blaze, Babbitt announced a 30-day suspension of the program across the West while federal fire experts reviewed the policy. Later, he promised to revamp the program "from A to Z." Babbitt's timetable troubles Mitchell of the fire ecology center, which conducts 20 to 30 burns a year in four states, mostly on private land. Mitchell worries that the moratorium could last months because Babbitt's questions about the program aren't easily answered. "Every year that we are unable to burn acres in desperate need of burning, we get farther and farther behind," Mitchell says. "Prescribed burns are something we will need to continue from now to eternity." Stephen Pyne, a fire ecologist with Arizona State University and a big proponent of prescribed fire, says "we need to rethink how we do it," and suggested the time may be right for a general review. The simultaneous escape of two burns means something systematic must be wrong with the Park Service program, he says. "It's not just someone misplacing a fax with the weather forecast." After Cerro Grande, Pyne says, the first thing many TV reporters would say to him is "we need to protect prescribed burning because it is inherently good." The same attitude prevailed a century ago when firefighters were first promoting suppression, he says, but it's not that simple. "Today, the analogy is that we can't criticize prescribed burning because it will send a confusing message. I think it may be mandatory in every place in the West, but that doesn't mean we have to defend the way it is being done now." "
The author reports for the Arizona Daily Star in Tucson. Note: in the print edition of this issue, this article is accompanied by a sidebar, "More trouble waits in the wings."